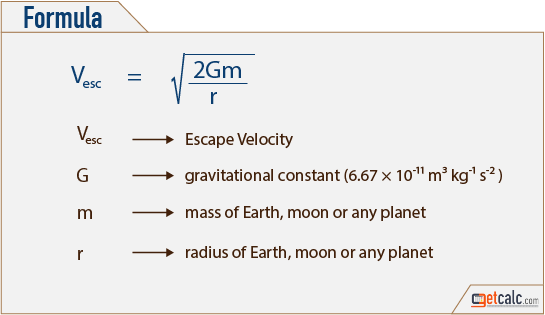 getcalc.com's Escape Velocity (ve) Calculator is an online physics tool to calculate the magnitude of minimum speed or velocity required for an object to leave the surface of mercury, venus, earth, moon, mars, jupiter, saturn or any planet, in both US customary & metric (SI) units. Escape Velocity, sometimes represented by ve, is a measure of physical quantity that represents the magnitude of minimum speed or velocity required for mass of an object to leave the surface of mercury, venus, earth, moon, mars, jupiter, saturn or any planet in the solar system. It's a force required more than the force exerted by the planet's gravitational influence of mass of the body or an object.